To view our current offering of an antique carved wood ship's figurehead from an American Sailing Yacht Ca 1865, click here! Presented is an authentic, American, carved wood, ship's figurehead with an impeccable provenance as a deaccession from the New Bedford Whaling Museum as the successor to the Kendall Whaling Museum Collection where it had resided for the preceding fifty years plus. And before that it was the property of Henry Plimpton Kendall and his wife's. The visual impact of this work of folk art is of a lovely woman, at piece with herself, and her surroundings. As far as female figureheads go, she is lovely to look at. The carving of the draped skirt is emphatic and conforms to the curves of the female figure. Some say, the grooves or folds of the material are deliberately slanted to shed water. The central section of the body is likely made of one solid piece of wood. However, the truncated forearms are fashioned of wood planks, and are kept close to the body, retaining the compactness of the whole. This is something that bespeaks of our seagoing heritage in a form that is to be enjoyed by everyone. 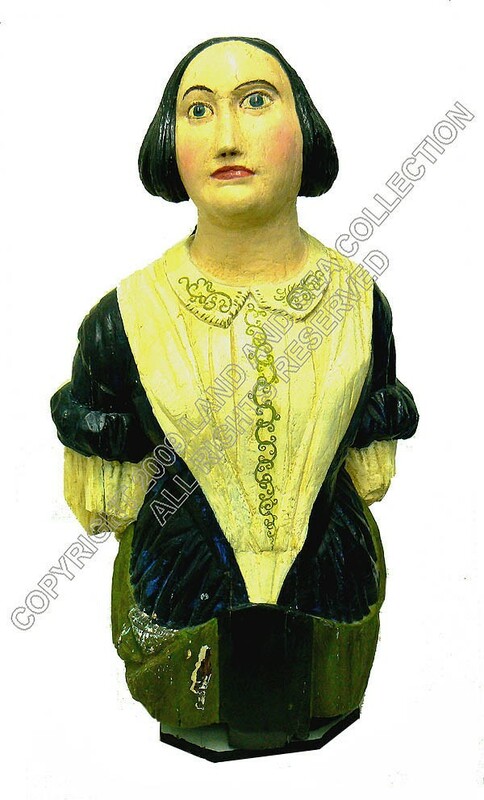 PROVENANCE: This figurehead was purchased, probably in the mid 1950's, specifically for the Kendall family, by M.V. (Marion Vernon) Brewington a noted expert in the field of ship carving. Brewington, at one time was the marine curator of the Peabody Museum of Salem, a director and CEO of the Kendall Whaling Museum, and was one of the two or three leading authorities on ship carvings and figureheads of his time. His book, "Ship Carvers of North America", was considered the last word on carving. It came into the New Bedford Whaling Museum collection in 2001, when the two collections were merged; and it was de accessioned from the Kendall Collection, now part of the NBWM, when it was acquired by us in 2009. 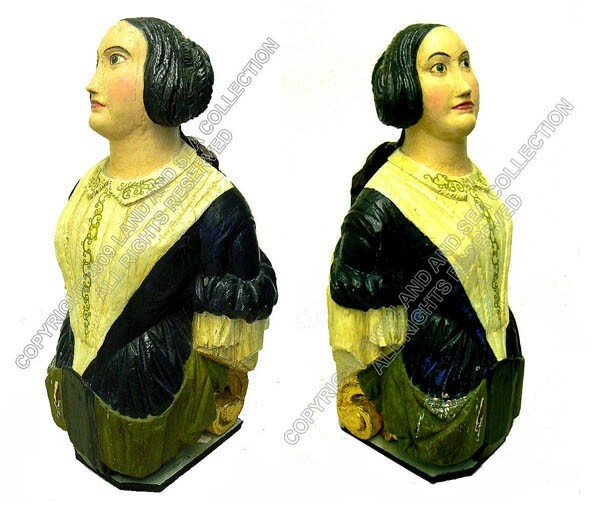 FIGUREHEAD VALUES: The prices of such works of folk art increase appreciably when the name of the ship or the carver is known, and with its condition and prior ownership (provenance). And, then even more depending on the size of the figurehead and the prominence of the vessel and the artisan who made it. Carvers such as William Rush of Philadelphia, Simeon and John Skillen of Boston, J. D. and W. H. Fowle of Boston, and John Bellamy would head the list. 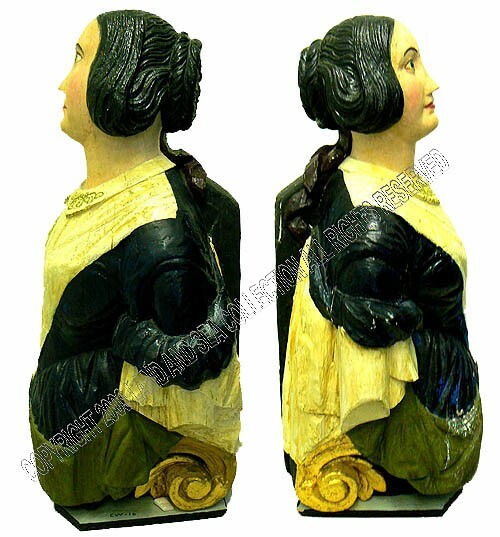 For large figureheads do not be surprised to see prices approaching $300,000.00 and more such as the one from the Brig Martha sold by Northeast Auction in 2007, and even small ones can command high prices of $190,000 if all the factors are known. Figureheads as an art form are long past, having gone the way of the sailing ships upon which they graced the bow. American figurehead carvers were renown for their work, which flourished from colonial times until the late nineteenth century. Most every class of ship, from steamboats to whalers to clipper ships, came to be ornamented with carving which would include trailboards, stern boards and various types of figureheads. As was fitting, large ships generally had full length figures of generous proportions while smaller ships had busts, heads, and half and three-quarter-length figures with scroll and leaf carving fitted as is the case of this example. During the 18th and 19th cent. a highly developed and original folk art of figurehead wood carving flourished in the United States at a time when little other sculpture was practiced. Few authentic examples survive. CONDITION: The central trunk seems to be made of a solid piece of wood with the extremities made from a series of wood planks standing on the vertical. There is an undercoat of gesso over the wood, and then a series of layers of paint that date back over the years with the top coat being done some time ago. The top of the dress is dark blue, and the central portion of the bodice is off white. 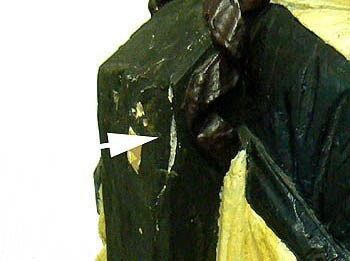 The green portion of the skirt shows some scuffing on its right and there is an area of lost paint. There also is a narrow piece of missing gesso on the back. Elsewhere, here and there are the normal marks of age as would be expected. 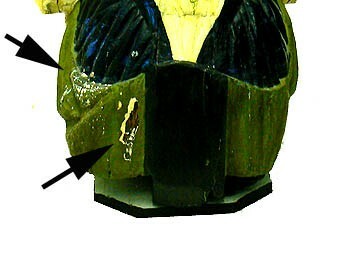 The figurehead rests on a classic gilted billet-head. SHIPPING & PACKING: The cost of shipping, packing, handling, and insurance to your destination, is an additional charge. You may email us to get these costs. We price our shipping honestly, but we expect to be reimbursed for the nominal cost of packaging materials and handling. The figurehead will be crated and packed by specialists.